Divorce combines emotionally charged issues with legally complex problems that require long-term resolutions. Phoenix family lawyer Steve Sufrin — founder of Steven E. Sufrin, Attorney at Law — will help you make good decisions by combining your wishes with Arizona law to get the results you want. Since establishing his law firm, he has earned a reputation for his unflagging client commitment, serving as both a dedicated advocate and a sounding board. Steven E. Sufrin, Attorney at Law, is a law firm that focuses on clients, not money. The end of a marriage is especially hard on children. Divorce lawyer Steve Sufrin understands that every decision made when a marriage ends through separation and divorce impacts children. He looks out for their best interests and encourages his clients to do the same. 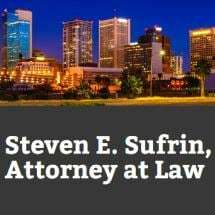 While compassionate in all dealings with his clients and their children at his law firm, Steve Sufrin takes an aggressive approach when it comes to protecting their rights. Whether he is trying a case in court or helping to negotiate a more peaceful outcome, he vigorously represents his clients with dedication and diligence.